The photographer doesn’t always have to be someone you hire. In the studio of the future, forget about having to go through the laborious process of having to book a studio, hiring a photographer and editing the images manually at the end. Depending on the type of product you are shooting, there are different equipment you can use. Product photography has traditionally been done by professionals in the studio. 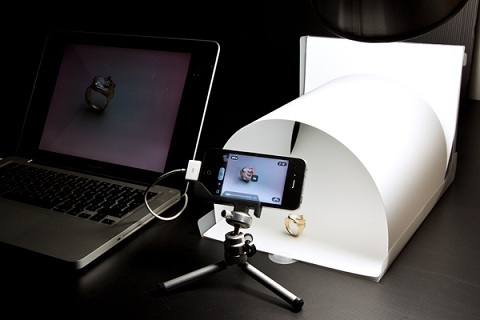 But now, with smartphones and cheaper lightboxes, we have now turned to shooting product images by ourselves. Now most people own a smartphone that is capable of taking good quality images. If you have the later versions of iPhone or Samsung smartphones, you could shoot some decent images. Smartphone cameras these days come with auto focus functions, sensors and built-in HDR that have made photography so user-friendly. Flat surface: For any type of products, work with a stable and flat surface to avoid any awkward lines in the background. White Craft Paper: This can be easily sourced from your local craft store, or it could just be laying around somewhere in your work space. They can be used as a base for your product to lay on. Lighting: As much as possible, try to utilize natural lighting in the early afternoon. Avoid the golden hours so that your product images would not have orange-yellow tones to them. Having a DSLR camera can help you achieve better results because you get to manually set the camera to get images closer to your desired look and save much more time in post-processing. Just remember – the quality of your images depends heavily on lighting, background and post-production. White backdrop: To achieve a good quality white product photography image, use a backdrop that transitions seamlessly from vertical to horizontal place. Point is, you want to avoid harsh edges where light can bounce off and create harsh lines in your images. Lighting: You could still use natural light by placing your backdrop to face the windows. Otherwise, it would be wise to invest in artificial lights to achieve even lighting 360 degrees. But what if machines can replace professional photographers and designers? Inconsistency is a huge concern when it comes to shooting with your smartphone or a DIY studio. From your background to camera, you have to constantly adjust your settings in order to achieve consistent product images. Furthermore, the post-production stage can get pretty tedious when you need to manually remove any unwanted background image using software. In the end, your workflow is slowed down and becomes much less efficient. We all know, or suspect, that machines are now increasingly intelligent and able to work like us. With robots taking up the role as a care taker in Japan’s healthcare scene, to billingual retail robots that can deal with customers more effectively, the development of smart machines have empowered our lives significantly. Evidently, they are gradually able to complete tasks that we previously deem mundane and inefficient. Automation technologies are increasingly playing a huge role in our lives. Automation refers to how an activity can be operated without any human intervention, and just purely based on technologies. This would determine the extent to which an activity can actually be replaced by machines. We can begin by looking at the various aspects of operations. This includes a wide range of activities such as collection or processing of data, interaction with customers and setting up of operations. While many analysts have emphasized that machines cannot replace humane feelings, overall technology feasibility has improved drastically over the years. Benefits of automation have started to outweigh manual labour. There are various factors that can reduce cost overall: Output level, quality and errors. Social acceptance and regulatory issues are also crucial in determining whether machines can rightfully replace human labour. In theory, machines could technically replace all jobs if deemed more efficient. However, people expect human contact in services they purchase and consume. With various challenges and expectations ahead, the road to automation is a rocky, but increasingly invisible one. The same applies to photography as well. As product photographer mostly takes place within an enclosed areas with mostly fixed equipment, photography can be automated. Imagine stepping into a studio with no photographers, but just machines. Anyone could just step into the studio and start shooting professional looking product images and have it ready for use within seconds. In product photography, ORBITVU has already created automated photography equipment that have made adjustments of lighting, positioning and cropping of images within a finger’s touch. Visual content creators can have much more easier lives as smart photography equipment are now able to remove background images within 5 seconds. That is almost 150 times faster than an experienced graphic artist would need to spend on using a software. In the studio of the future, ORITVU’s Alphashot XL LED Pro that comes with laser pointers and precise camera support, the role of a professional photographer could well be taken over by smart-machines. You can check out these cool equipment at Pruto Imaging and see how you can adopt them for your company. You can even contact them to try out these machines. Moreover, in a rapidly changing E-commerce industry, suppliers need to be able to put up product images as efficiently as possible. Even if product images taken by automated machines might lack the human touch, but what good will human intervention do when you just want to sell a product fast? The studio of the future is not that far away. With machines getting smarter and smarter, even highly-skilled task such as photography can be replaced in the near future. There might be no need to hire professionals in product photography anymore thanks to standardized procedures and automated post-editing production. But before you decide to adopt automation technology in your product photography, you can always turn to SnappyFly for a low cost, short turnaround solution!